The essays were inspired by a series of workshops led by Evans and Chen on Co-operative Security 2.0, organized by the University of British Columbia and the Shanghai Institute for International Studies (SIIS) with partner institutions over the past two years. The meetings ranged over orders including hegemony, concert, security community, consociational, pluralist and multiplex. Among the many questions addressed in this cover package are ones about “paths to great power restraint and accommodation, the roles of and limitations of Middle Powers ‘in between,’ rules and who makes them, the ingredients of a stable balance of power, the function of trust and empathy, the tension between value-based and more inclusive arrangements, and the intersection of alliances and inclusive multilateralism,” Evans and Chen write. The hope is that these essays will contribute to a new generation of thinking about Co-operative Security 2.0 and a security order that can manage a turbulent transition. Elsewhere, in our Debate section, we ask whether South Korea made a good or bad decision in closing the Kaesong Industrial Complex — the only remaining symbol of inter-Korean co-operation. Seoul took the surprise move in response to Pyongyang’s latest nuclear test and missile launch, and it is likely to see an escalation in tensions on the Korean Peninsula in the months ahead. In our Features section, we examine how the China-led Asian Infrastructure Investment Bank, which attracted participation from a number of US friends and allies despite strong opposition from Washington, is shaping up to be an important venue of US-China rivalry for influence in the region. We also chronicle how the annual ASEAN Defense Ministers Meeting, which has now spanned a decade, is quietly contributing to greater mutual understanding and security. In addition, we explore how Kim Jong Un’s efforts to play Russia off against China may ultimately backfire, given the greater hand that China holds, and also examine the future role of the United States in Asia in the face of China’s rise. Our In Focus section is the first in a two-part series on the results of the latest Nuclear Security Index, a report first produced by the Nuclear Threat Initiative, a non-governmental organization, in 2012 and again in 2014. The latest report was issued in January this year. We look at the findings for China, India and Pakistan. As always, we hope you find value in this latest issue of Global Asia. The launch of the ASEAN Regional Forum resonated with the ideas of comprehensive security enshrined in ASEAN processes and the new ideas of co-operative security developed in Europe in the late 1980s. Middle Powerism in the 21st Century: Mission Impossible? Being a middle power in today’s world is far different than it was when the concept was ascendant in the 1990s. The dream of an inclusive multilateral world has stalled and great power politics have reemerged in the Asia-Pacific region. South Korea's challenge is dealing with the security challenges and great power rivalry on the Korean Peninsula, alleviating Chinese concerns over trilateral co-operation, and shaping a regional order away from zero-sum security competition. Trust deficits in East Asia stand in the way of a genuine security community in much of the region. The key to overcoming that is empathy, a concept new to the discourse on security order. Asia’s political and strategic diversity is an obstacle to a co-operative security order that will require shared values as well as common interests. The rise of China and its assertive stance on maritime disputes is fueling moves to enhance old Cold War alliances. Despite a complex emerging order, traditional security alliances will still play a role, but through more complex institutional arrangements. The balance of power is changing in favor of Beijing, but it need not lead to conflict. New approaches are needed to the Asia-Pacific security architecture, especially given China’s rise and rivalry to the US. 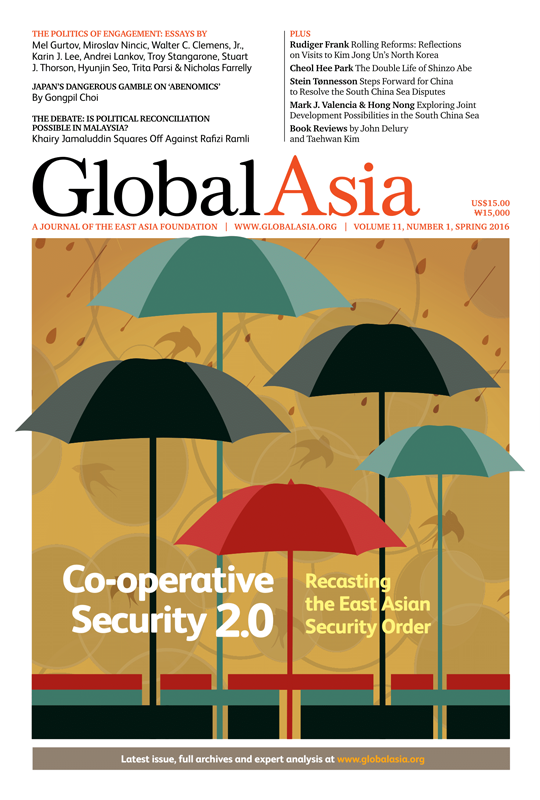 How a co-operativesecurity order for East Asia has evolved and what kind of order isachievable — and appropriate. Closing Kaesong: A Good or Bad Decision by South Korea? There are reasons to be optimistic about change in North Korea, but now South Korea will be much less of a part of this process than it could and should be. In the words of an old Chinese proverb, sacrificing the plum tree for the peach tree. It was the right decision. The ASEAN Defence Ministers’ Meeting turns 10 in 2016. In its next decade, it will need to preserve both its relevance and ASEAN centrality in the regional security architecture. While North Korea has been trying to repair its relations with China and draw closer to Russia, its January nuclear test calls into question Kim Jong Un’s diplomatic efforts to use Russia as a way to pressure China. The AIIB represents a significant milestone in China’s emergence as a regional leader, and Washington’s ham-fisted opposition to its creation dismayed its allies in Asia and even Europe and played into China’s hands. A call for mutual respect and co-existence among great and small powers in East Asia. China is likely performing better than it is being given credit for by the Nuclear Security Index. The gap in perception is troubling, but India is well advised to reflect on its position and make improvements. The Nuclear Security Index is a helpful tool in assessing some aspects of nuclear security, writes Pervez Hoodbhoy, but it cannot capture the unique threats that Pakistan faces from loyalties divided between faith and nation. Asia’s Latent Nuclear Powers: Japan, South Korea and Taiwan By Mark Fitzpatrick, Complexity, Security and Civil Society in East Asia: Foreign Policies and the Korean Peninsula Edited by Peter Hayes and Kiho Yi etc.